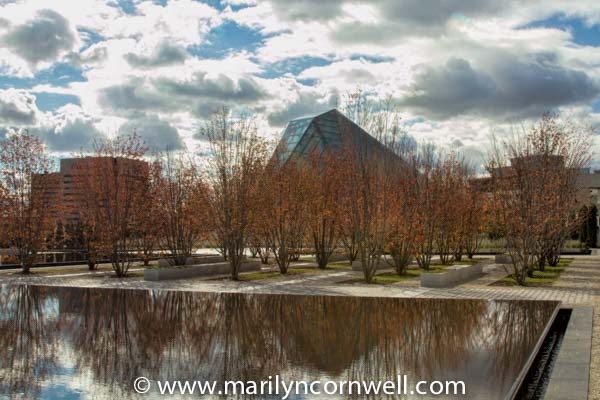 I was at a garden meeting at the Toronto Botanical Gardens yesterday and took some time to visit the Aga Khan Museum and Garden. I wanted to see the Autumn colours as this is a key feature of the plant choices. There was a some colour, but the leaves have been blown off the trees so there was less than I'd hoped for. This is such an astonishing building and garden. With the infinity water pools, the white walls of the building, and the grand walk ways, everything is harmonized and serene. Coming back to Niagara, we drove around the escarpment and took a view of Niagara Falls from Megalomaniac the Winery. Remember the posting last week 'The Great Toronto Mirage'? 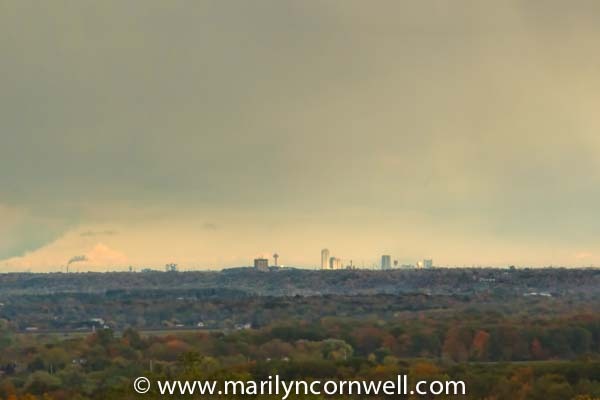 Yesterday's view of Toronto was very clear and the buildings on the landscape extend from Toronto right through to Hamilton in a continuous line. At Megalomaniac, I was able to get a good picture of the Niagara Falls view, and include a cropped view so you can see the 'thumb print' stubby building in the centre. It is Brock University in St. Catharines, and then Niagara Falls is beyond that. The Skyline Tower is the telling shape of Niagara Falls. There are no articles (other than camera lens compression) to explain this compression phenomenon that we saw. 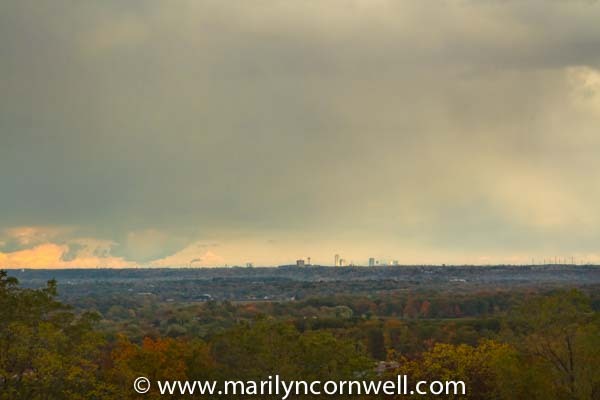 Storms were ahead for the Niagara Falls area. Voting is ahead for us today.